When I was much younger, my brother and I used to play a game fondly referred to as the 'Treasure Game'. I owned a little pirate's chest-style hinged box, full of odd rhinestone earrings and broken necklaces (the debris from various family members and flea markets) - the sparklier the object, the better. After emptying the contents onto the floorboards, we would proceed to play a game based mainly on a bartering system of our own devising. Once we had each taken it in turns to pick things from the glittering pile, we would make all sorts of deals to complete our desired collection. "I'll give you this set of 'diamonds' for the 'ruby' necklace and the 'gold' ring". 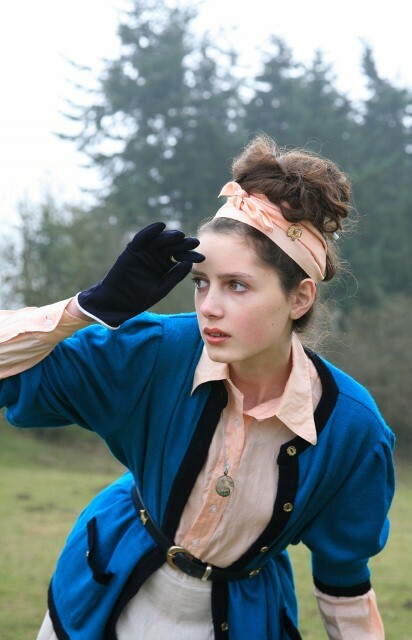 "Only if I can have the blue 'sapphire' brooch"
We felt like pirates, sorting out ill-gotten gains - complete with sulks when it didn't work out. So, you can imagine my delight when LUXXOR vintage offered to add something new to my rather extensive collection. A few days after I gratefully accepted, three items: a gorgeous brooch, ring and cameo necklace arrived. I especially love the brooch/ pin, which can be seen in the first two shots (along with the charming ring). 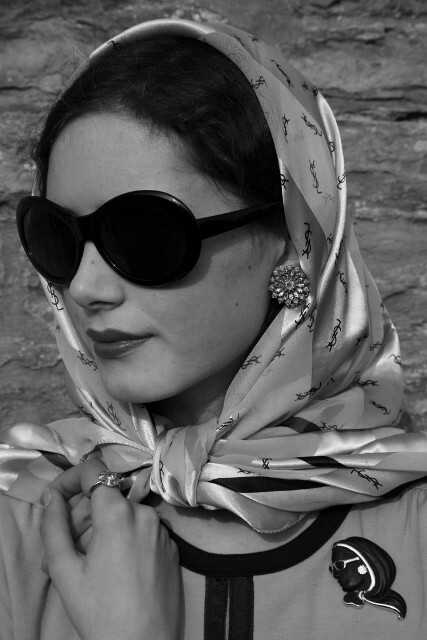 I thought that the 'woman in profile' was so stylishly attired, that the only way to go was to to emulate her - using a charity shopped YSL scarf, vintage sunglasses and a family owned clip-on earring. 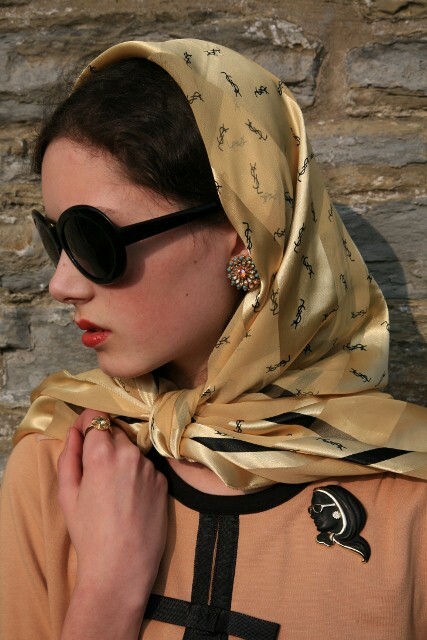 I'm not sure if it is odd to think about an inaminate object's story, but somehow I can just imagine the woman that this brooch could represent - the scarf is there to protect her hair in an open topped car as she makes her way to meet with her fellow glamorous fifties-era friends. To round off a jewellery saturated post, I have a Giveaway for my lovely reader. 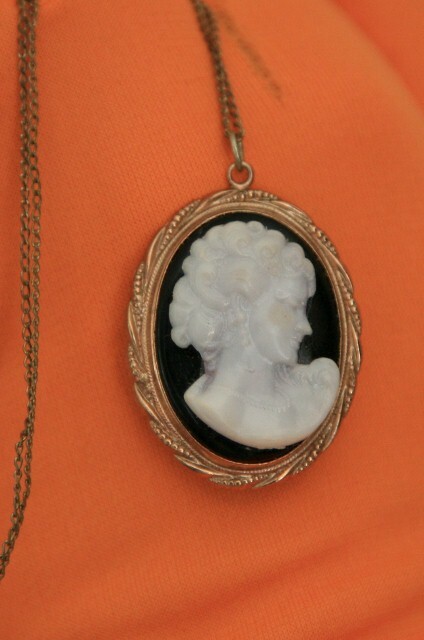 I will be sad to part with this beautiful cameo necklace so soon after receiving it from Luxxor, but I thought someone out there might really enjoy wearing it. So, for the rules: You must be a follower of Clothes, Cameras and Coffee. Please leave a comment describing whose face you would like to see on a cameo - I for one would love a "Twiggy" cameo, complete with her pageboy haircut! The giveaway will be live for 10 days, and will end on 9th April. 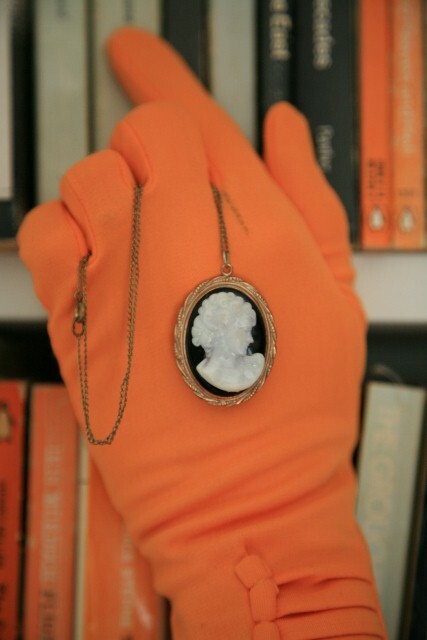 (Cameo necklace - modelled by my mum complete with my own vintage orange gloves - courtesy of Luxxor vintage). First, above are two sets of photos by two great photographers, taken of the outfit I wore on the third day of London Fashion Week (technically my second day - I had a lightweight visit!) As you can see from the change in shoes, I wore my gentlemen's brogues to traipse to the venues, and then changed into a pair of Topshop heeled ankle boots later on. Footwear aside, the rest of the outfit is comprised of my great-grandma's blue angora wool cardigan added to a handmade underskirt bought from a local vintage shop, and belted with a leather belt from a charity shop. The hat belonged to the same great-grandma (she liked her angora! 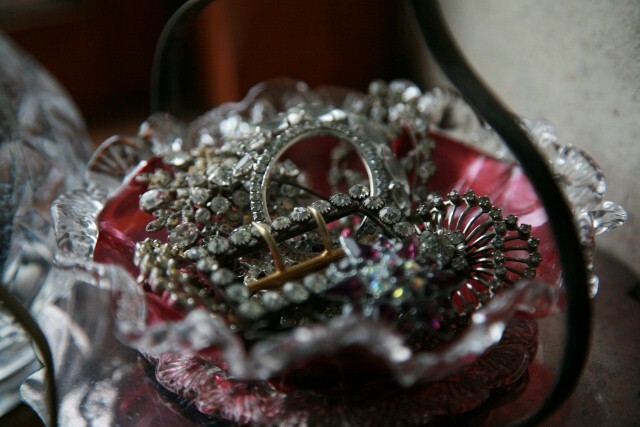 ), with a brooch from a flea market. I have on a pair of my 'mummy's scissors' (home made by me) and the bag is vintage. The faux fur jacket was from a charity shop. 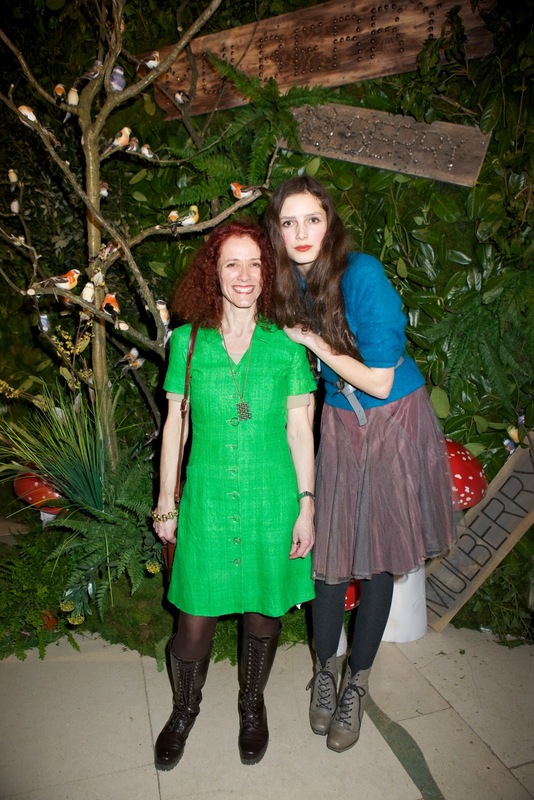 The last photo was taken at the Mulberry party. One of my favourite things about London Fashion Week is how unpredictable it can be. You can turn up in the morning, never quite knowing what will happen. For example, when meeting up with the stunning, stylish and effervescent Bip, she asked if my mum and I were interested in going to the party. I would have (literally) jumped at the chance, but I was wearing heels, so instead I just nodded very enthusiastically whilst gulping down coffee. Mulberry is probably in the top three shows I would love to attend (the phrase 'beg, borrow or steal' an invitation comes to mind), and I really admire the direction Emma Hill has taken the brand. So, after a long day, my mum and I found ourselves ordering a taxi for Claridges. The surreal feeling was only intensified by the incredible countryside themed props, from birds on branches to oversized toadstools. Bip also has a younger sister, the gorgeous Evangeline, who is with Storm models. I am itching to turn my camera on the beautiful pair! The first show I saw was Louise Amstrup, which was a wonderful start to the few intoxicating days I spent in and around Somerset House. After queing for ages in the rain whilst ogling creatively dressed people, we were greeted by thumping techno music - I wasn't sure what to expect. However, the minute the first model emerged from the side to be illuminated by the wall of lightbulbs, I knew in was in for a treat. Showing as part of the On/Off program, her collection featured all sorts of details I love - stand out hats and headpieces, an intermixed range of interesting fabrics and colours (greys, blacks, dusky purples and yellows), and my favourite detail - reinterpretations of classic ideas. These are the kind of clothes to be worn to sashay through a misty city - the structural elements emerging and disappearing through patches of fog. A Vauxhall Fashion Scout show that I enjoyed was Masha Ma, which combined elements of ladylike elegance (long skirts, tailoring etc) with a more provocative frisson - namely the red PVC boots. I thought the structure of these garments were amazing, sometimes with details resembling waves and ripples (the jacket above) or fanned book pages. I always admire collections where the quality of the craftsmanship is apparent. As I was sitting quite far back, I could only take waist up shots of both shows - as demonstrated in the photos above! Serenity is a word that has been resonating over the past week - on both an international, and personal level. The events in Japan and now in Libya have been full of destruction and tragedy, with occasional moments of calm - like a tiny break in the clouds. In the face of adversity of this magnitude, I wish that those who are actually experiencing and living through the stories we see in the newspapers could be granted some form of serenity. I was feeling rather serene when these photos were taken (nothing like a walk in the hills to vanquish revision stress), which is odd as the original inspiration for the outfit was a 'jolly hockey-sticks' style 1930s tennis outfit - not exactly an idea usually associated with peaceful pursuit! However, the clear blue skies and airy feel evoked nothing less than a sense of freedom - or maybe I'm just being too poetic. 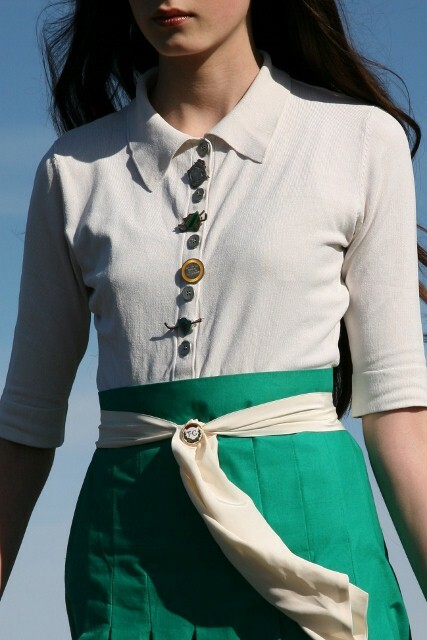 The idea for this outfit started with the skirt - I noticed the emerald green pleats, like a bold peacock, among the many rails of garments at 'Bang Bang Clothing Exchange' in London. (I would link to their website, but they don't have one). I had about an hour to spare before catching a train home, and after making a round of the charity shops, I thought I might pop into this place. All that I can say is that I will return again, with plenty more money to spend! I think this skirt is vintage 'Browns Boutique'? You know an item is special when you start planning outfit combinations in advance. What might I wear with this lovely length of linen, I pondered on the train. Perhaps that silk jersey shirt bought from a charity shop in the summer? Maybe alongside my white brogues? And the battered vintage brief case I found at a jumble sale? This little dress up game in my mind passed the time comfortably, and when the ensemble made the transition from hypothetical to actual (the next day), I added a white silk sash, and lots of vintage badges down the front of the shirt. They are all sporting mementos, proclaiming exciting things like "Ladies tennis finals 1953" and "Hockey Championship". I enjoyed collecting brooches (I saw them as treasure) when I was little, meaning that they were my first foray into vintage jewellery. You know the over-used term 'visual feast'? Do you think it was created with his designs in mind? 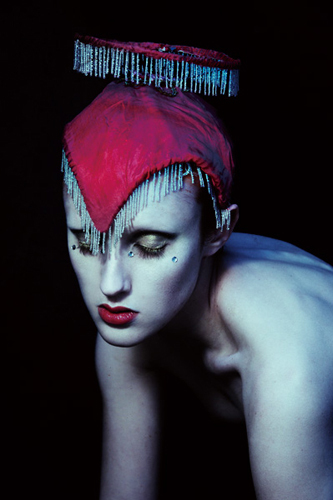 Maybe it is the delicious theatricality, combined with the Man Ray-esque photography, that made me gasp when I saw the lookbook. I'm not usually a fashion luvvie (similar to a theatre luvvie who proclaims that everything is "fabulous darling" and "a triumph my dear! "), but this did elicit a kind of 'Oh-my-gosh-these-are-amazing-I-want-to-wear-them-and-stare-at-them-lovingly-before-taking-photos-of-them-in-interesting-locations' reaction. If I ever pursue photography as a profession, I want to borrow some of these for a shoot! 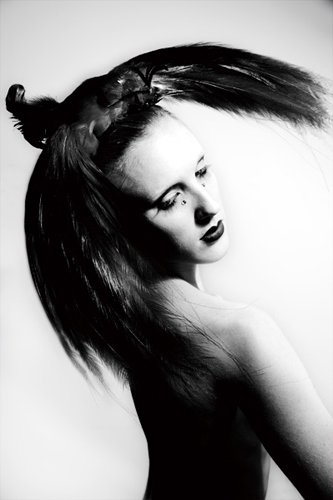 However, I think that these photos are perfect - just the right combination of lighting, model and stylised feel. In these tumultous last few days, the overall outlook has been one of extreme sorrow - with flashes of hope inbetween. I was planning to post this yesterday, but somehow it just felt too inconsequential in comparison to the devastation experienced in Japan. The earthquake and tsunami have been much on my mind, as I'm sure it has for most people. I got into school early on friday morning, and noticed that some BBC footage was being streamed onto the whiteboard. I assumed that our teacher was preparing for a lesson, using an old news story, until I noticed the date in the corner - 11th March 2011. My friend and I watched in horror as footage of the wave covering buildings filled the usually blank screen. People came in laughing and joking, and as they noticed a gradual hush descended. Since then I have followed the updates on the Guardian website, and all I can say is that shivers run up and down my spine whenever I read about the latest number of casualties or the ongoing Nuclear problems. Sometimes it feels too intrusive seeing everything so immediately. Let's keep Japan in our thoughts and prayers. I have just started reading Brideshead Revisited, and have been very inspired by the ideal of pre-WW11 Oxford; full of tea in delicate china, champagne and strawberries, long summer days and punting down the river. Obviously I know this is not the main thrust of the book, but oh how it makes me want to don a silk chiffon dress and recite TS Elliot at dinner parties. Taking this as my inspiration, I devised an outfit that was a kind of feminised collegiate interpretation - right down to the bejewelled heels. 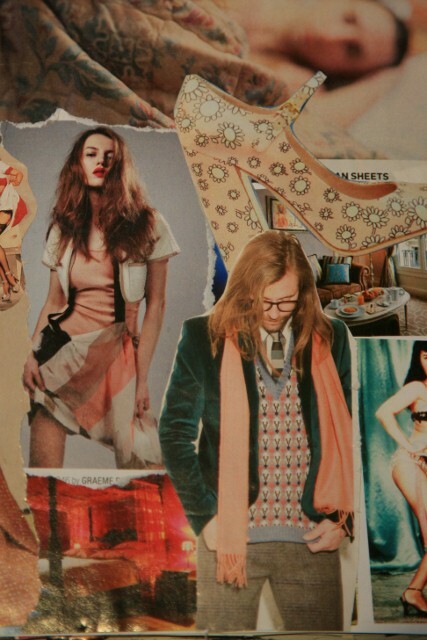 I have also included a section of a moodboard I made that I thought reflected the feeling of the ensemble. The silk shirt was my great-grandma's, as was the matching sash (tied in my hair). 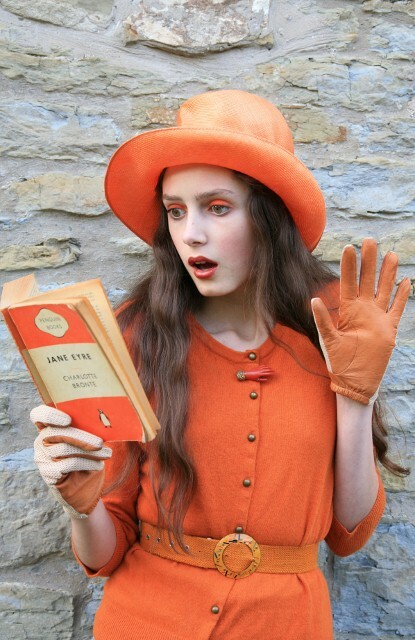 I bought the cardigan in a charity shop last week, as I adored the colour. The culottes are vintage seventies Marks & Spencers ('St Michaels'), also charity shopped, and the tights are from Next. I have to force myself not to just lazily reach for the culottes every day - they are the clothing equivalent of a social chameleon - changing the way they look depending on the context. The incredible satin shoes were given to me by Rosie, a stallholder from whom I buy copious amounts of vintage clothing and costume jewellery. The carpet bag was bought for me by my mum, and the little Radley belt is thrifted - the pin on the scarf in my hair and the necklace are vintage (from family). The gloves were given to me by the very kind Pearl. My mum took the photos (In the photography stakes here, my dad needs to get his act together! Mum is beating him on the tally of recent shoots), on the hill above my village. The mist provided wonderful photographic atmosphere, and there was a sense of drama to the landscape. The title is taken from Nick Drake's album of the same name - his music is incredibly calming in this time of unrest. I think he had an innate ability to sound like he was singing to you personally. If you haven't already, please read Jill's poignant post about Japan. Her suggestion about donating to the Red Cross (or another organisation) here is beautifully phrased. My thoughts are with any and every person affected by what's happening in Japan - from those who have lost family members or are currently unsure of their whereabouts, to those caught up in the chaos. Jill spoke of the blossom season in Japan, and how these delicate blooms in our country are like a reminder of those who are no longer with us. I feel that blossom, like so many other elements of spring, is a constant symbol of rebirth and new life. However, it will be a long time before the people, particularly of North-East Japan can recover, both structurally and emotionally, after this tragedy. Sunlight - don't you sometimes just feel like you need to run out and harvest it? One of my favourite things about living rurally (apart from the typical rolling hills, birds chirping, lambs gambolling etc - all the stuff you find on postcards), is the beautiful light. From the sun rising over a misty lake in Autumn to brilliant winter sunsets, or in this case golden light at five o'clock, it all makes for both a wonderful experience as well as a good photographic opportunity! I am a 'natural light' purist - whether behind or in this case, in front of the camera. Obviously, as an aspiring photographer, of course I want to learn about how to use proper lighting. However, when the natural light is as incredible as this, who needs a van full of equipment? Nothing beats running around with a camera, a friend for a model and bag of clothes for styling on your back. The title itself is a reference to another Beth Jeans Houghton song - her music is indeed golden. Although I know that one of the key SS11 trend is seventies, I've subtracted ten years and am feeling very inspired by the sixties at the moment. I think there are several reasons for this..
1 - My grandma's home in London is a completely wonderful sixties time warp, right down to the original Saarinen table and chairs with a bubble lamp curved over it. It feels like I am immersed in that dizzy decade whenever I step through the front door. 2 - I have been spending free time recently cataloguing all my hundreds of 'inspiration images' ripped out of magazines, and sticking them into scrap books (I have about five so far). There have a been a lot of sixties images - both fashion and interiors related among them. 3 - The sixties is one of many decades I am studying for my American History exam. Okay, I'm not claiming that Lyndon B. Jonson's foreign policy inspired my look - I'm thinking more about the popular culture side of things here. Also, there is something rather liberating about wearing sixties (or 60s inspired) clothes - after all, that is one of the things that decade stood for! Whether it was Mary Quant popularising the mini-skirt or the widening of the generation gap, those ten years represented huge social (and style!) change. 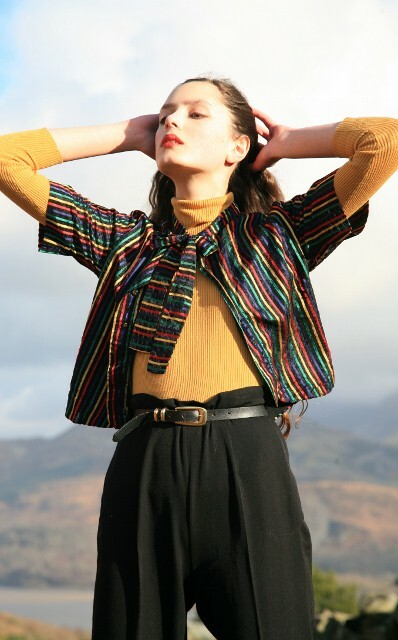 I know I posted a Mad Men inspired ensemble a while ago, but each coin has two sides, so I think that this outfit represents its opposite - summed up by Diana Vreeland in the phrase 'The Youthquake'. Think of Edie Sedgewik, Jean Shrimpton and Twiggy. In fact, a great photographer friend of ours tells the most magnificent stories about living in a flat near Twiggy in the late sixties. The tunic pictured here (bought from Beyond Retro in London) was one of the first ever items I wore on my blog. Then it was an actual dress, as opposed to the bottom skimming tunic it is now. However, there were several months where the size of my rib hump pre-surgery prevented me from wearing it. Now I have 'rediscovered' it. I layered it over a gold shirt bought from a charity shop, and Next cream cable knit tights. The emerald beauties on my feet were bought from a specialist vintage shop over the christmas holidays. I feel like I should start clicking my heels and monologuing about "home", such is the Wizard of Oz-esque feeling they evoke. The leopard print gloves are vintage (family owned), as is the Betty Barclay bag in the first shot. Thank you to my ever-wonderful mum for being willing to drop her work for twenty minutes to wield a camera in a field. I would like to say I am levitating in the first and last shots, but sadly no. However, I did have a lot of fun jumping for photos (Deja Vu! 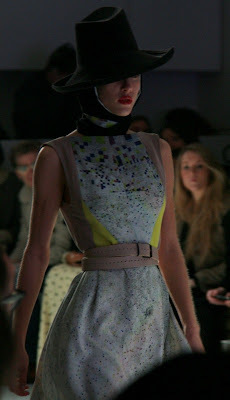 It reminded me of LFW and the wonderful Style East) and it is very liberating for me to be able to move like that again. Inspiration. What can you say about it? It's wonderful, a natural partner to imagination, and often strikes in the oddest of places. Case Point number 1 - I recently walked into an old fashioned sweet shop in search of Sherbert Lemons (to which I think I may be addicted!). 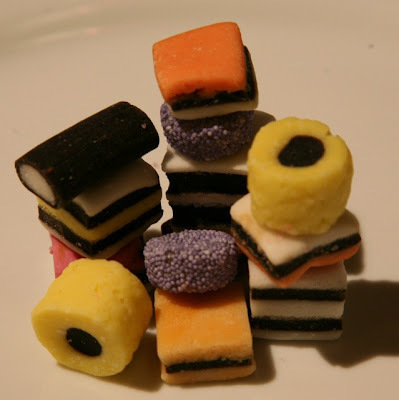 But the first thing that caught my eye was a jar of brightly coloured liquorice allsorts. They instantly reminded me of how much I love the look and primary colours of these soft candies, even if I can't stand the taste of liquorice itself (alongside fennel and aniseed). That very morning I'd been musing about how to style these gorgeous Katharine Hamnett tailored trousers sent to me by the fabulously kind Pearl, and here (suddenly) was a ready-made colour scheme in a jar! The trousers could be the 'liquorice' - all I needed was a bright upper half. So duly I added a charity shopped Marks & Spencers polo neck, and a striped blouse that my late great-grandma handmade (she of the extensive hats and gloves collection I frequently wear). The belt and shoes are both charity shopped too, and the ring is inherited. I often speculate about when my great-grandma made that vibrant blouse, as from most of the photos I've seen of her, it's not the kind of thing I can imagine her wearing - she was a real 'twinsets, pearls and handbag' lady. My mum took the photos of me while on a long weekend by the Welsh coast. For me this outfit appeals to my sense of nostalgia. Not only is it inspired by one the great joys of childhood (eating sweets), but the trousers also really remind me of film stars of the black and white and technicolour era. In fact, they instantly make me think of Katherine Hepburn - and also makes me feel somewhat sophisticated. In addition, the outfit back story brings to mind the particularly delightful 'Toot Sweets' sequence in the film Chitty Chitty Bang Bang. My family and I watched it before Christmas while I was recuperating after surgery, and it was perfect escapism. Talking of recovery, and going back to Pearl (who is among the kindest and most supportive bloggers I've met online), these trousers arrived as part of a goody pacakge while I was in hospital after my operation. She suggested that I would need something comfortable that would "go well with flats", and these trousers could do the trick - she was right. Dressing while in recuperation proved quite a challenge, and alongside these I usually resorted to diaphanous silk shirts, shift dresses and wrap skirts for comfort. Pearl recently wrote an article about The Big Hearts of Bloggers, and I wholeheartedly agree with her sentiment. What she failed to mention is that she has one of the biggest hearts of all! I have been so lucky in the amount of support I have recieved in the time I have been writing this blog (it'll be two years this summer). I know that sometimes any form of social networking is assumed to be plagued by nasty and/ or offensive anonymous comments, or that it contributes to a decline in face-to-face interaction, but I have rarely experienced that while blogging. What was your favourite sweet (or candy) when you were little? Alongside the aforementioned sherbert lemons, I also had a definite weakness for jelly tots and sherbert dips. 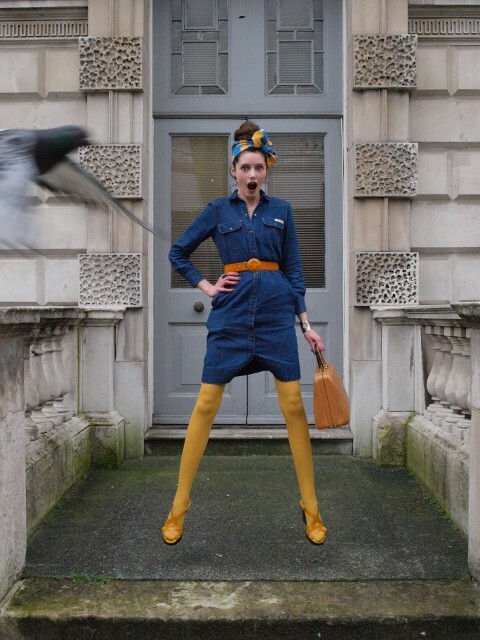 I have to thank the wonderful Style East for taking what I think is my favourite photo of the whole fashion week - it really encapsulates all that is whimsical, fun and fantastical about LFW. By the monday, I had got used to the whole rather fabulous circus/ cabaret that is Somerset House, and was up for some fun. So when I meandered outside with Style East, the first thought that went through my head was "jump!" And reader, she got the shot - in one! Please do take a look at her blog if you want to read a fantastic post! I know that sometimes naysayers claim that fashion gives nothing to the world and is merely a frivolity. Well, the latter maybe has a little truth - we've all overheard a vacuous conversation or two at some point. However, the same argument could equally be applied to the fields of modern art, sport, cars, fine food or wine etc... And I really resent the view held by some that if one enjoys fashion one must be a 'bubblehead'. Fashion may not solve world crisis' (but it can be valuable to help rebuild psychological confidence - read Linda Grant's 'The Thoughtful Dresser' if you don't believe me), but to use a suitably cheesy Devil Wears Prada quote - "We live our lives in it". And one of my favourite things about living in good clothes is the sheer fun it presents. I love getting up on a weekend, knowing that I can choose to wear whatever I want, and that I can enjoy the process of putting it together. Likewise, one of the best parts of behind-the-camera shoots with friends is the organisation and styling stage. 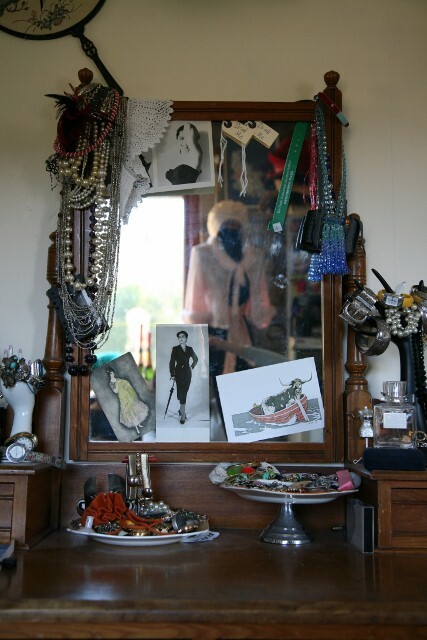 After all, isn't styling merely an extension or update of the beloved childhood dressing up box? "Colour crisis! Can't decide [if] Aquascutum mac is orange, tangerine, mandarin, satsuma, Libby's Orange C, Quosh or FiveAlive #madeuplfwtweets" You can see @MichaelHogan for more gems. Alright, Jane Eyre may be a bit of a cliched blogger book choice (at least I didn't include my matching mug! ), but I plead my case on two points. One, it is the orange-est cover on my shelves. Two, it also happens to be one of my favourite reads - I sped through it. The cardigan is from a charity shop, and the accessories are all family inherited. Another little humorous detail I noticed at LFW was this dog peering out of a bag at the Jaeger London/ Vodafone show. (The photo is mine). My mum and I were musing as to whether it belonged to someone backstage, or whether there is the equivalent of a dog modelling agency for shoots and catwalks requiring a canine element? Thanks once again to lovely Amy at Vodafone. Edit: The dog has now been named as Butters, and belongs to The Clothes Whisperer. This was apprently Butters' catwalk debut, and this cute little canine has her own dogblog here. 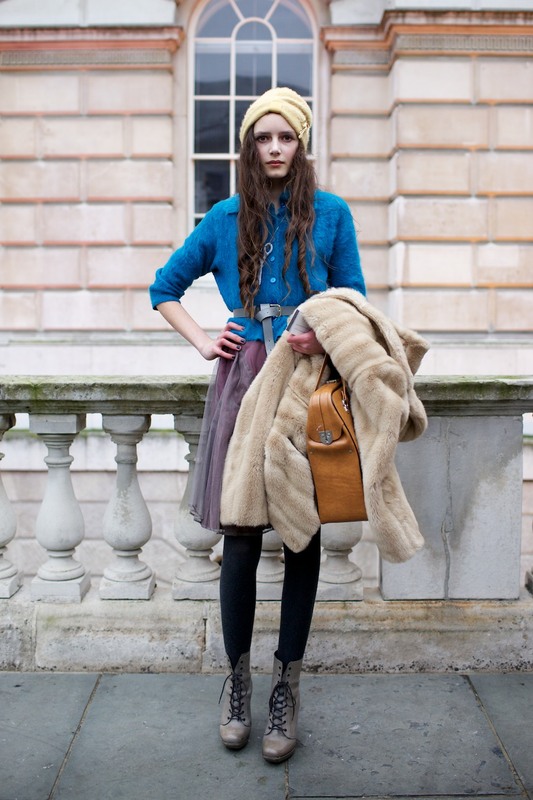 Finally, to do the usual blogger thing, here is a summary of what I was wearing on that monday at London Fashion Week. The denim dress is vintage Calvin Klein, bought off ebay. The headscarf is Charlotte Taylor, the bag was from a charity shop stall at the Big Chill music festival and the belt was my paternal Grandma's. I think her late son (my dad's brother) made the buckle? The shoes and tights are both from ebay. 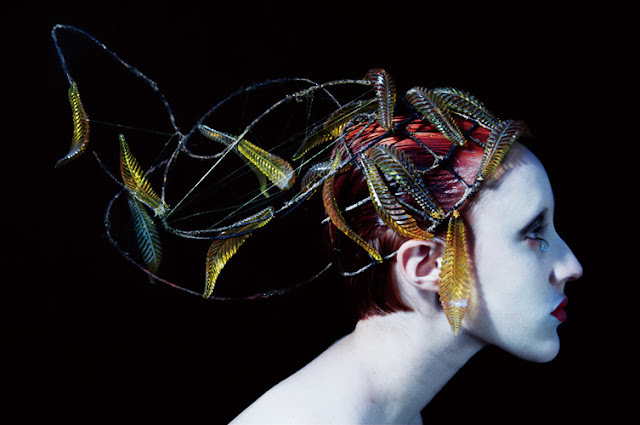 Do you think that fashion has both a place as art (Alexander McQueen springs to mind) as well as the simple function of being worn and enjoyed? What about the humour of fashion? I particularly loved seeing milliner Stephen Jones' latest hat collection, which has a great sense of whimsy and not taking itself too seriously (a Chanel-style cardigan for your head? An upside down bowler hat?) in the topsy-turvy inspired creations.